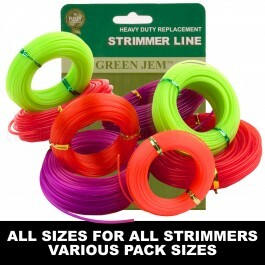 Please select your strimmer line thickness and pack quantity from the drop down menu. These packs of replacement strimmer line are perfect should you run out half way through strimming your grass. Comes in variable sizes with a helpful guide to thicknesses, so you can get the right wire for your strimmer and and grass blade thickness. If you are unsure why not try one of the mixed packs of strimmer to see what works best in your strimmer for your grass blade thickness. Also bulk buys available for the gardening businesses. 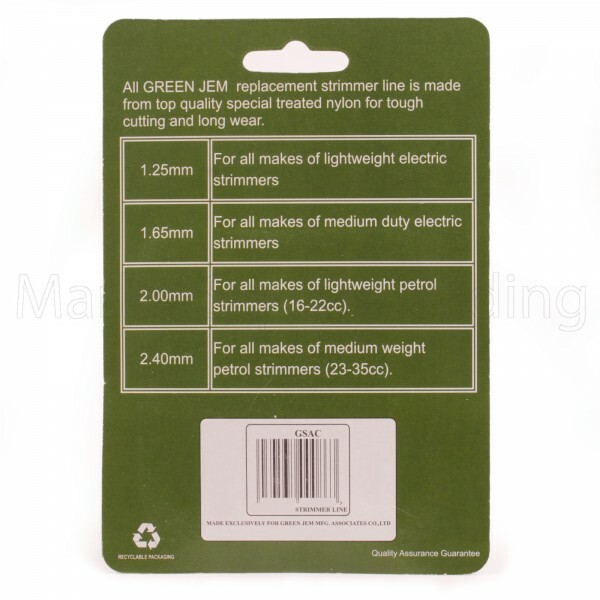 We have been selling and using this product locally for the last 20 years.Green Jem strimmer line is a very good quality product. Please note that strimmer line may be dispatched out of the bulky packaging to save on postage costs which keeps the price down for the customer.